weed and replant degraded coastal reserves, and seek to preserve and enhance the biodiversity of the bushland along our beautiful coastline. We welcome involvement by all ages within the community. Joondalup Community Coast Care Forum is the incorporated umbrella group for three unincorporated coastcare “friends groups”: Friends of Sorrento Beach, Friends of Mullaloo, and Friends of Iluka. 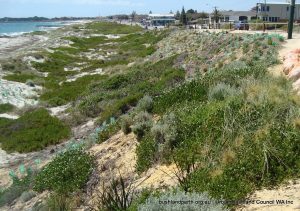 Joondalup Community Coast Care is currently carrying out revegetation at a number of sites at Sorrento, Mullaloo and Iluka. We plant local indigenous shrubs and ground-covers in winter; weed in winter, spring and summer; and hand water some sites in summer.